I help you navigate in today’s gig economy by sharing the freelancing skills I’ve learned over the last 25+ years. Productivity tips, evaluating new products, learning new skills, finding clients, and billing for your hard work! You can benefit from my lengthy experience and success of working independently. Your iPhone may contain thousands of photos, but movies are the really big space hogs! Use the Mac’s own Image Capture application to quickly find the biggest movies and then delete them. 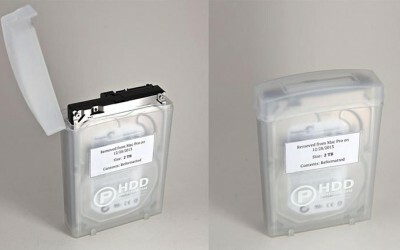 These inexpensive, anti-shock, dust-free, splash resistant, plastic cases are a perfect way to safely store both 3.5″ SATA and IDE hard drives. Cost is $6.99 from Amazon. I’ve tried just about every Mac keyboard over the last 25 years — searching for the best combination of features and feel for touch typing. After only two days of use, I know I’ve found the best so far: Logitech Wireless Solar Keyboard K750 for Mac. People rely on “show notes” for podcasts and “minutes” for business meetings. Here’s a post to summarize a few of the points I made at a recent dinner with friends. My iPhone 4S has a shiny, slippery back. I worry about it sliding around my desk, especially as it vibrates for phone calls, emails, text messages and other alert notifications throughout the day and night. Here’s an inexpensive, non-stick solution. Google can find specific types of files. For example, Adobe Acrobat PDFs, Microsoft Word, Excel, PowerPoint documents. They’re easy to find using Google’s filetype keyword. How Long Should an Individual Keep Their Paper Tax Records? Keeping accurate paper records is important for identifying sources of income, expenses, property records and completed tax returns. You should keep these paper records for a certain amount of time in case you’re audited. But how long? The answer is: it depends. Sometimes an image is too big for a single PowerPoint slide. Rather than shrink it down or just divide it up, here’s how to spread the image across multiple slides and smoothly animate its appearance. This is a very effective way to present graphic information in a timeline. I decided to redesign my business card because of the rapid changes in today’s social media environment. Here’s my before and after design makeover and all the reasons why.